Drive south of downtown Breckenridge and within five minutes you could arrive at any home for sale in Mountain View Subdivision. The homes were likely built in the 1980s or earlier, but many have been remodeled. It’s a neighborhood popular with locals because it is cheaper than downtown Breckenridge, very private and is only a gentle climb out of town — not a steep drive like those who live on Boreas or Hoosier Pass experience. The privacy and the fact that the Blue River runs through Mountain View makes it appealing for a vacation home. Mountain View is part of the old Blue River Estates property and consists of about 50 lots most of which are developed. About a tenth of the available lots are still vacant land and half of those would be difficult construction sites. This makes it a developed neighborhood, with plenty of trees and social hiking trails to the river and the small lakes in the neighborhood. The Blue River is its most like a wetland here on the east side of Highway 9, so getting to a major recreational trail will likely mean walking on the road. Mountain View is the lowest of the old Blue River Estates and closest to the highway of those on the east side. Some homes face what is the most noisy thing in the neighborhood, but the trees and the fact that the neighborhood is downhill are mitigating factors. Homes in Mountain View have a big variety of river, trees and sunshine and to find the right, personal balance will be easy, but require some looking for those who want to buy a house in this neighborhood. 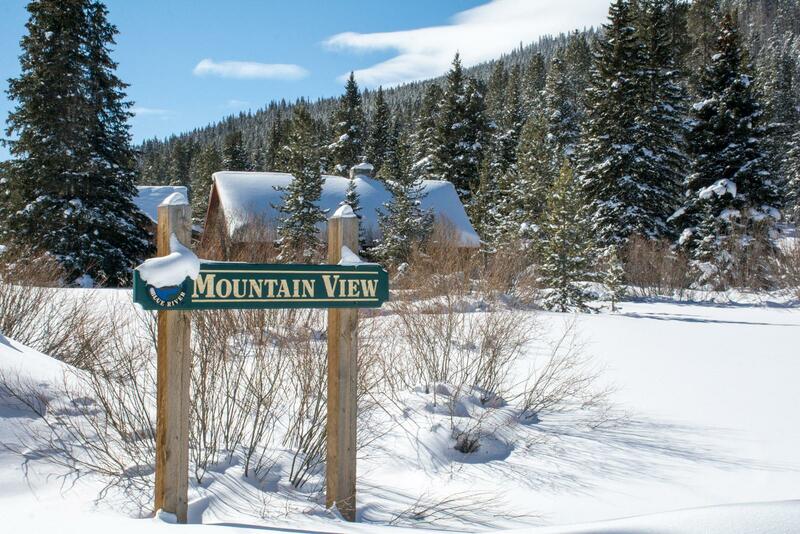 Blue River Estates was created when the father of long-time Breckenridge resident Robin Theobald's father bought 1,200 acres of land in 1960 from the city of Colorado Springs. The elder Theobald, Bob, thought he'd sell the land to people wanting fishing cabins on Pennsylvania Creek or along the banks of the Blue River near where this creek empties into it. Because their settings are pretty idyllic these little estates of 1/4 to several acres are family friendly and great vacation homes. Because the Breckenridge ski resort is just a mile or so down the road, they are some of the most charming places to spend a winter vacation in all of Colorado. And for the reason that many of the older homes in this neighborhood were set up as summer homes, they are set up to survive their owner's absences. They are good candidates for off-grid living. Electricity has always been available but only recently did natural gas come to the neighborhood. Septic systems and on-site wells are the norm. Sun is a Colorado native most every day of the year. Within this part of Breckenridge, forests are dense and the many trees dapple that sun like the hides of the horses of the Utes who used to summer in the valley. Choices of sun orientation and proximity to water in this area can meet many tastes, but are definitely factors to consider when looking at homes for sale in Blue River Estates. The sun will rise later as the ground rises steeply to the east, but homes along the Blue River enjoy long afternoon sun and great views of it setting over and behind the Tenmile Range. A trail through the neighborhood is likely to be found near any home for sale in Mountain View, and as your neighbors will tell you, find your way over to Pennsylvania Creek, and a trail along the creek will lead hikers, bikers and cross country skiers quickly to public lands in the National Forest. This trail continues to a ridge between Pennsylvania and Indiana Creek and on toward Baldy Mountain until it intersects with Boreas Pass Road. Miles of trails connect in the area - some better than others for these various uses - but homeowners in Blue River Estates can get so familiar with the area they may never get in a car again to start a hike. Fishing on the Blue is some of the best in the state, and all residents of Blue River have access and use rights on Goose Pasture Tarn, on the north side of this neighborhood.